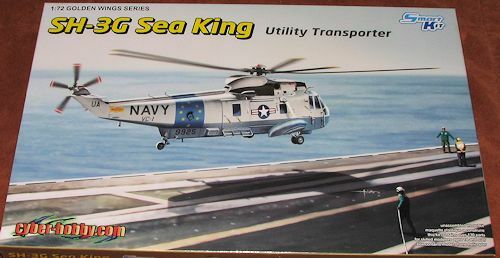 During the 1990s, the Sea King was replaced in the ASW and SAR roles by the U.S. Navy with the newer Sikorsky SH-60 Sea Hawk. However, the SH-3 continued to operate in reserve units in roles including logistical support, search and rescue, and transport. On 27 January 2006, the SH-3 was ceremonially retired at NAS Norfolk, Virginia, by Helicopter Combat Support Squadron 2 (HC-2). They have been replaced by increasingly advanced variants of the SH-60 Sea Hawk. Interestingly, the VH-3, operated by the USMC is still the official helicopter for the President. The SH-3G, and subject of this kit, was a cargo, utility transport helicopter for the U.S. Navy. 105 conversions from SH-3A and SH-3D. The larger, braced, horizontal stabilizer incorporated into the SH-3H ASW version was retrofitted to extant SH-3Gs. . 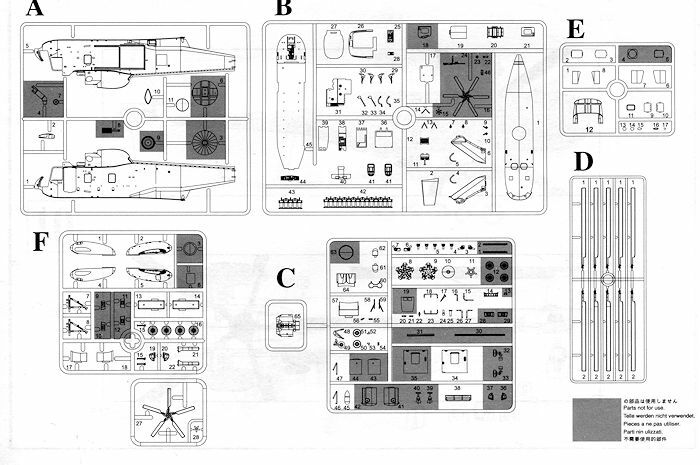 This one continues the series of Sea Kings being produced by Dragon/Cyberhobby and the first non-Westland kit I've had the chance to preview. There is a great deal in common with the Westland kits, as you might expect. This one is devoid, however, of any offensive equipment and there is a plug provided to cover the hole for the dipping sonar. The cockpit is well appointed, including pedals, collective and cyclic controls. The cabin has a row of fold up seats along either side. The cabin and cockpit doors can be posed open if one wishes. Here are a complete list of features from the PR folks. Markings are provided for three aircraft, all in white over light gull grey and all from the 1970s. This means that they all have the shorter horizontal stab. One is the box art plane from VC-1, which was based in Hawaii until the base closed in the early 1990s. 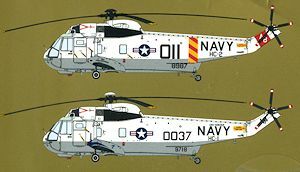 An HC-1 plane aboard the USS Oriskany with blue sponson markings and an HC-2 plane with a red/yellow band from the USS JFK round out the decal options. 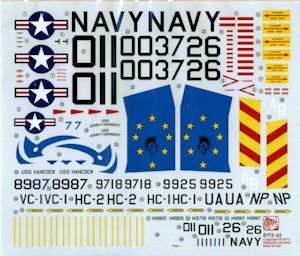 This one makes a nice addition to their Sea King kits and is one that will look great in with your helo collection. As a final note, your editor did an SH-3G back in 1985 when stationed on Diego Garcia. Using individual numbers and letters, I built one of the two aircraft based there for SAR and other work using the Fujimi SH-3H kit.